Small - $19.99 Medium - $19.99 Large - $19.99 Only 1 left! You've just moved to a new neighborhood, and your neighbors seem to take Halloween pretty seriously. It's all about the classics! Classic games, classic candy, classic house haunting tricks. Looking down your street on Halloween night is a parade of Halloween hits—from vampires to ghosts to princesses to pirates. So, seeing how you're new to town, you will want to make a splash in the neighborhood. Opt for a classic look for your little one, like this Girl's Red Riding Hood Costume! It's bound to bring joy to both the wearer and watchers alike. As she skips from house to house, she can hand out baked goods from her basket to her new neighbors, and replace each item with a handful of candy! Sweets for the sweet! Dress her little brother as the Big, Bad Wolf and prepare to become to coolest new family in town! 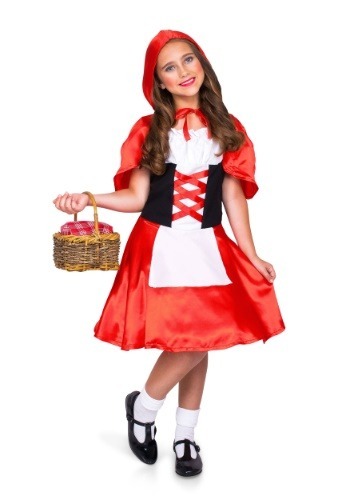 This look is prepped and ready for a fairy tale Halloween! It's a dress styled as a shiny red A-line skirt, white peasant blouse, apron, and corset lacing. The matching red cape has a hood—they don't call her "Riding Hood" for nothing—and ties under the chin for easy wear. Pair it with bobby socks and Mary Janes for a totally classic look, or get her ready for a real romp through the woods, with a pair of laced boots! It's nice to make a good impact on the neighborhood, but it's nicer, still, to bring out the best in your girl. Of course, she loves classic Halloween fun as much as the next person, so bring on the caramel apples, spooky houses, black cat lore, and bewitching ghost stories. And now that she's in unfamiliar territory, make sure she's always on the lookout for that wolf, especially on Halloween!